Our PVC Curtains prevent air pollution and are designed to fit in areas that are uninterruptedly segregated. They work well in both reducing heat and foreclosing cool air. 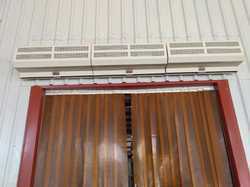 These strip doors give good space to a person or vehicle to enter hassle free and they also get closed on their own. They are energy efficient, require minimal maintenance and are available in various colors. These curtains generate pollution free and easy to breathe environment.